Many are saying that this is the “perfect” Chop Cup for the working performer. They are refashioned ACTUAL Starbucks Espresso mugs so they have a magnetic base. But these mugs are EXAMINABLE and look perfectly normal. As Starbucks is an internationally recognize brand—an addiction for many, actually—the cup is perceived as a familiar prop. 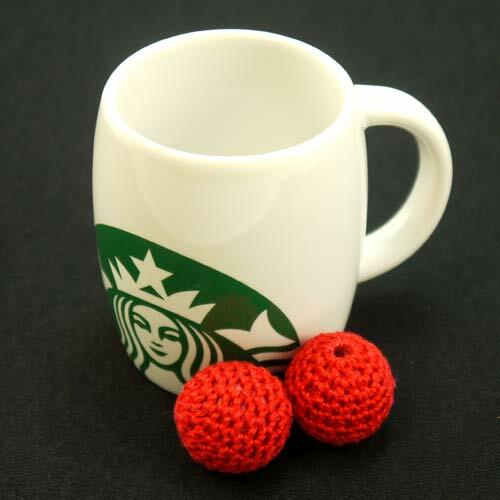 The Starbucks Chop Cup fits comfortably in the hand and in the pocket and come with two small croche balls. The magnet in the balls has been perfectly balanced to create the perfect release action. The whole kit comes in a red velour bag for travel. This Chop Cup will last a lifetime, and amaze every group you work for. Available in Espresso size (3 fluid ounces) or a slightly larger mug (8 fluid ounces). Choose when you add to cart.